The King Street Pilot has been a success in reducing travel times for streetcars through the core area with knock-on benefits to the outer parts of the route in reduced short turns and more reliable service especially outside of the peak period. Headway (the space between vehicles measured in time, not distance) is a big issue for riders, and it also affects crowding levels. If a service is scheduled to show up every 4 minutes, and actually does so, then on average each car will have a similar load (subject to surges that will upset this), and riders can expect an average waiting time of half a headway. Even if they just miss a car, they know fairly certainly that the next one will be along soon, and it might even be in sight. A chronic problem on all transit services is the bunching of vehicles that can yield two (or more) cars or buses close together followed by a long gap. When cars bunch, riders inevitably pack onto the first one. This is not simply a lemming-like desire to rush the first car, but the effect of years of experience telling riders than when there is a bunch, some of the cars will be short turned. If they are on the first one, they can at least drop back one car when this happens. If they are on the second or third in the parade, they may get dumped off and face the next big gap. Some transit systems implement time points along a route where vehicles will hold for a scheduled departure time. A more sophisticated version of this is to hold in order to space out service regardless of the schedule. Riders do not care if a car (and its driver) are “on time”, only that the headway is close to the advertised value. It is the transit system’s problem to sort out operator crewing with schedules that can be achieved most of the time, but which are not excessively padded to the point service dawdles along a street. The latter has been a problem on some TTC routes where extra running time overshot the mark leading to annoyingly slow service and congestion at terminals where vehicles arrive early. With the removal of much of the downtown congestion, and hence the variability in travel times for that part of the route, there was hope that headway reliability would improve. Results to date leave a great deal to be desired. There has been some reduction in the most annoying of wide gaps, but bunching remains a problem. To be fair, when the scheduled headway is under 4 minutes, some bunching is inevitable. Even if cars leave the termini like clockwork, demands at stops vary as does the traffic enroute, and cars will get slightly off schedule. The follower will catch up, in part because of the lighter load from its shorter headway. A terminus is the simplest place to monitor and dispatch service, and headway variations should always be the lowest at these points. When the scheduled headway is small, the allowed 6-minute window for being “on time” permits vehicles to depart in bunches and still be “on time” because they remain within the allowed variation. A perfect four minute headway would depart a terminal at 0, 4, 8, 12, 16, 20, 24 … minutes past the hour. The same vehicles operating in pairs at 0, 7, 8, 15, 16, 23, 24 … would be “on time” because the alternate cars in the sequence are only three minutes late. This problem is worse for wider scheduled headway because until the “five minutes late” line is crossed, the service is on time. 0, 6, 12, 18, 24, 30, 36 … and 0, 11, 12, 23, 24, 35, 36 … are both “on time” but the latter actually provides a 12 minute headway of vehicles in pairs. The TTC has, in effect, constructed a target for “on time performance” that considers bunched service to be acceptable even at a terminal. The problem with this is that as vehicles move along the route, the headway variations get bigger and bigger. It is ironic that even with this generous standard, actual service across the system does not achieve anywhere near the target on the streetcar or bus networks. The streetcar network itself went into a long slide through 2017 thanks to declining vehicle reliability and the proliferation of construction projects. In past analyses of streetcar and bus routes, the problem of bunching has shown up in various charts. Here is the service southbound from Dundas West Station on November 21, 2017 (in the second week of the pilot). This is not much different from what is seen on any date and route. The range of headway values is clustered within a six minute window during peak periods (whether it is actually “on time” is of little matter to riders), but outside the peak, things get more erratic. Another way of looking at this data is with a scatter diagram of multiple days’ performance. The chart below shows the last full week of November 2017 and shows that the scatter seen on November 21 above is not unusual. In week 2, there are more values above the 10-minute line, and these were generally the result of short turns that prevented all of the service from reaching Dundas West Station. 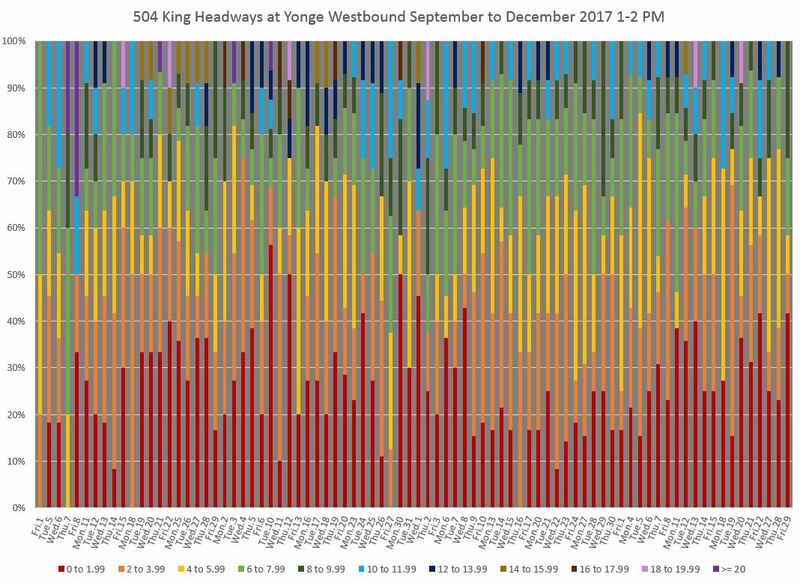 In my preliminary review of the King Street Pilot based only on November 2017 data, this type of improvement gave some hope that the variation in headways would be improved. However, further results out to the end of December are uncertain on this point. Factors such as weather and changes in traffic patterns for the pre-holiday period (including declining enforcement) could be contributing to the results, but this remains to be verified with data from early 2018. The data have been grouped into two-minute intervals ranging from 0 to 20 minutes with the colours progressing from very short (red, 0-2 minutes) up to very long (purple, over 20 minutes). The height of each section represents the proportion of vehicles whose measured headways fall within each range. Ideally, we should see little red except during the AM peak when the scheduled service is very frequent, and we should also see little of the colours at the other end of the spectrum which signal wide gaps in service. 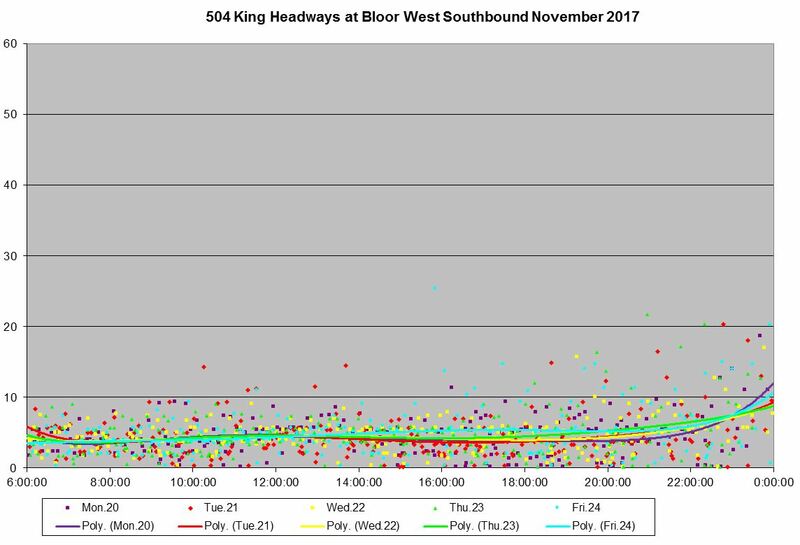 Note that the scheduled headway for 504 King at midday is 4’50”, and we would hope that as much of this chart as possible would be yellow, with some spillover into orange (2-4 minute headways) and light green (6-8 minute headways). Headways under two minutes are seen quite commonly, typically for about 20% of the vehicles, but rising to 40% on occasions. The very high spikes in short headways are matched by an increase in long headways (mauve and purple). A gap car is usually followed by a parade on very short headways and this can give a small presence of “long” colours and a large presence for “short” ones. The broad band from 2 to 8 minutes (orange, yellow, light green) brackets the scheduled headway and contains the lion’s share of the trips. However, a considerable number remain outside of this area. Variations from day to day are quite common, and this shows the dangers both of taking one-day samples and of averaging over longer periods. A one-day sample might, or might not, be representative of “typical” conditions. Averaged values would smooth out the variations. There are five-chart sets for locations beginning at the eastern and western termini and progressing along the route. The last of the trippers leaves Broadview Station westbound just after 8:00 am, and only 16 cars are scheduled for the 8-9 am period (approximately a 4 minute headway). Most of the trips lie within the 2-6 minute band although there are some headways below 2 minutes. Between 1-2 pm, twelve car are scheduled to leave Broadview Station on a 5 minute headway. The chart shows how much of this is distributed over a range of 2-8 minutes. Between 5-6 pm, fifteen cars are scheduled on a 4 minute headway. As at midday, the actual service lies mainly between 2-8 minutes, but there is a higher number of very short 0-2 minute headways. Between 8-9 pm, the service builds down to a 5 minute headway, and there are two carhouse trips which contribute to the proportion of short headways. Such a trip generates two low values – one for the carhouse trip itself, and one for the following regular trip. Between 10-11 pm, the service builds down to a 7’30” headway, and there are four carhouse trips which contribute to the short headways. Note, however, how often the large headway values over ten minutes push in at the top of the chart. At Yonge Street, 7 trippers pass westbound between 8:00 and 8:30 contributing to the number of short headways. After 8:30 service drops back to a 4′ headway. Between 1-2 pm, 12 cars are scheduled on a 5′ headway. However, actual headways in the 0-2 minute range are common as are gaps of 8 minutes and more. This shows how the service has become more ragged in its trip from Broadview Station. Between 5-6 pm, 16 cars are scheduled on a 4′ headway. As with the midday service, short and long headways are common, and the bands near the target value are squeezed from above and below. Bunching is common. Between 8-9 pm, 12 cars are scheduled on a 5′ headway, but again shorter and longer headways dominate the service. Between 10-11 pm, the service transitions to the 7’30” late evening headway, and so a range of values shows up here. However, values above 10 minutes are quite common. At Bathurst Street, the trippers pass westbound between roughly 8:10 and 8:40 am. This gives a mix of very short headways and the slightly longer 4′ base service for part of the hour. By 1:00 pm, the 5′ scheduled service actually appears with a wide variety of headways, and very short headways are common showing a good deal of bunching. In the PM peak, the 4′ scheduled service contains many short headways, again showing bunching. In the early evening, the 5′ service shows bunching, and oddly enough, this is worse after the pilot begins than before. It is possible that the pre-pilot period had enough congestion to prevent cars from catching up to each other. The situation in the late evening, as at Yonge, shows many short as well as very long headways. The headways at Jameson continue the pattern seen further east. On November 2, there was a delay and diversion via Queen resulting only in very long headways at Jameson. The disappearance of the trippers starting with the mid-October schedules is quite noticeable in the reduced prevalence of headways under 2 minutes in the 8-9 am period. Although the Scheduled Service Summary claims that the trippers resumed operation to Dundas West Station with the November schedules, review of actual operations indicate that may trips short-turned westbound at Roncesvalles Carhouse reducing the service to Dundas West Station. This explains the continuation of fewer short-headway trips there through November and December. They appear on the January schedule, but all service does not necessarily operate to Dundas West. Midday service departing from Dundas West on nominally a 5′ headway contains few short headways as compared to other locations and directions. 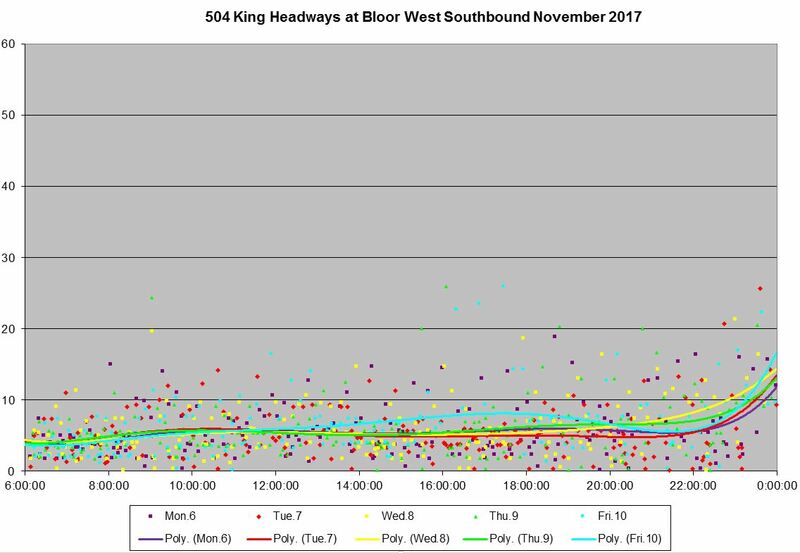 However, there are longer headways particularly during the period of the Queen/McCaul construction in late October showing the effects of short turns at Roncesvalles. The 5-6 pm period has a roughly 4′ scheduled service. What is quite notable here is the rise in the proportion of trips in the 4-6 minute (yellow) band for the first few weeks of the pilot. This falls off later in the year. Early evening service shows a drop in very short headways in mid-December. Late evening shows a high number of short headways because there are five running-in trips to Roncesvalles Carhouse mixed into the through service. 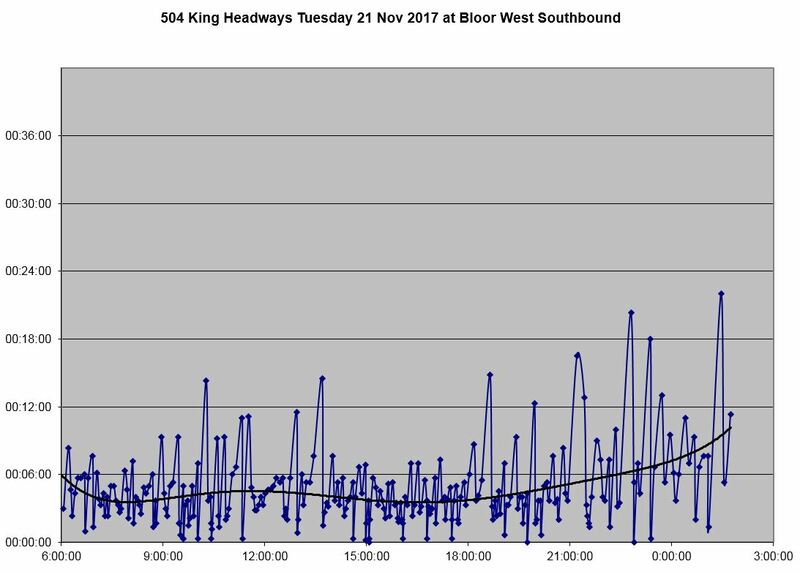 The level of AM peak service from mid-October onward does not show the same drop as seen at Bloor/Dundas (above) because the short turns at Roncesvalles are west of Jameson. Similarly, the construction at Queen/McCaul did not have as much of an effect here as at Bloor/Dundas on midday service. Just as at Bloor/Dundas, more of the PM peak headways are close to the scheduled level during the start of the pilot period (Nov. 13), but this falls off in December. Early evening service shows a considerable proportion of short headway trips indicating that service is already messed up inbound from Parkdale to downtown. Late evening service shows more wide headways during the Queen/McCaul construction and the week afterward. Service eastbound at Bathurst for 504 King (note that 514 Cherry is not included in any of these charts) has a similar pattern to that seen at Jameson. The number of very short headways from the midday onward shows that this service is chronically bunched. The second wave of trippers crosses Yonge starting about 9 am, and so they do not contribute to the shorter headways in the 8-9 am period. The irregular service originates in the west end of the route, outside of the pilot area, and deteriorates as it move eastward. This problem continues throughout the day. Evident through all of these charts is the degree to which service on 504 King does not maintain regular spacing, and this condition originates right at the termini where, according to TTC goals, it should be at its best. The generous six-minute window for “on time” departures allows service to contain bunches and gaps right from the end of the line, and these worsen as service moves across the route. Short turns persist at Roncesvalles during the AM peak, and these reduce the available service north to Bloor during that period. Last Wednesday I arrived at King & Spadina around 6:40 to catch a westbound car. After about 10 minutes of waiting, with no streetcar lights visible, I started walking west. The fact that headways on surface routes are not properly managed by TTC management and supervisors is not a surprise to customers but it is really good to have actual figures. Anectdotal info is often useful/interesting but nothing beats proper statistics. Thank you! Though having ‘time points’ on a route could certainly help to space cars out, it is my experience that if an operator stops for 2-3 minutes to ‘get back on schedule’ there is loud grumbling from his passengers. Properly spacing the departures from terminals may also help but, as you note, the current TTC definition of ‘on time’ is wide and much of the problem is caused by conditions encountered on the route (traffic, boarding times etc). Have the TTC now finished installing their updated ‘location’ system so that Transit Control, the on-street supervisors and the operators all know where they and other cars are? Until everyone knows the current situation it seems hard for any of them to ‘do something’ to address it. Steve: To be clear, time points should enroute deal more with headway adherence than schedules for frequent services. Except for a case where service is blocked and a queue forms, a parade of cars should not be allowed to form in the first place, and any automated monitoring system should detect that one is forming. As an aside, there is a particular problem at Roncesvalles Carhouse with long crew changeovers that disrupt the service. It will be interesting to see what happens once all of the changes are in the east end. The new VISION system is running behind schedule, but the early phases of roll out and testing are supposed to ramp up this year. I plan to do a background piece on what it is capable of doing, but have been waiting until it is far enough along that there is something to write about. If i understand the standards correctly a vehicle could leave just under 5 minutes late and be considered on time even if another vehicle should have already departed. In situations like this a vehicle should be late if it leaves after the scheduled departure of the next vehicle. Steve: The real problem is that they do not measure based on headway, only on the schedule. It is the spacing of cars that matters to riders unless service is very infrequent such as the night cars where a missed car costs you a 30 minute wait. This. This seems to be the single-biggest reason for streetcar rider frustration and an intervention here could provide the most value-add in the shortest amount of time. (i.e. it’s cheaper and quicker than ordering even more streetcars from Bombardier). Why doesn’t the TTC fix this? Why not shift to headway-based management? Is it concern over operator shifts? Is there an accepted/standardized “waiting time” metric that we could adopt, instead of the raw headways? Steve: The TTC already has different weights assigned to waiting time, transfers, etc. One approach might be to model a transit stop as having a steady supply of new passengers, and ask how long each one has to wait for the next vehicle. If vehicles are on a nominal 4-minute headway and actually stick to that (arriving at 0, 4, 8, 12, 16… minutes) then the average waiting time is half the headway: 2 minutes. If the same route has bunching (arriving at 0, 7, 8, 15, 16… minutes) then the average passenger waiting time is a little over 3 minutes, even though the average headway and average spacing is unchanged. Calculation: If we assume 1 passenger arriving at the stop each minute, then in the first 7 minutes there will be 7 passengers who accumulate, with an average wait time of 3.5 minutes. Between minutes 7 and 8, there will be 1 passenger, who waits an average of 0.5 minute. Gives an average wait of 25/8 = 3.125 minutes. The average person who comes to the stop waits for 3-plus minutes, not the 2 minutes suggested by the average headway. Reporting the average wait would be a more honest representation of rider experience–as such, I probably shouldn’t hold my breath for TTC management to adopt it. At a rate of 1/minute (the actual value does not matter) arrivals, H riders will accumulate in H minutes, and they will wait on average H/2 minutes for a vehicle. Very short waits (second and third cars of bunches) contribute little to the hourly total, while long headways contribute much more. Something for me to put in the hopper of route analysis techniques. Yes, turning actual minutes into weighted minutes gives a (hopefully) more rider-oriented ‘score’ to a particular trip or itinerary. Unfortunately, we don’t usually have access to granular, detailed information about the complete trip a particular rider makes. (Heck, the TTC usually doesn’t have that data either, as far as I know.) It’s therefore difficult – particularly for those of us on the ‘outside’ – to calculate and monitor those scores. I’m just shopping for a more focused answer to a narrower question – once I’m at the bus/streetcar/subway stop, how long do I have to wait for a vehicle? We all know that the nominal headways have only a tenuous connection to the question. Yep. The sum of those scores over a period of time, divided by the total time, gives the average (passenger-weighted) waiting time. Steve: At some point when I don’t have half a dozen articles on the go at once, I hope to turn to calculation of a wait time index as a way to track service quality. Also, according to the TTC’s new Five Year Plan, they intend to incorporate stop access and wait times in their planning process. It is unclear whether they will also include service reliability. In some foreign country cities the operating company is fined for short turning crowded cars but not almost empty cars. Of course this can only work if the operator is a different institute from the transit agency. Steve: That would likely be a situation where an outside (private) company operates service under contract. It would be part of their terms of service with built in penalties for non-performance. The ironic part is that if we ever do privatize any part of the transit system, the city will probably demand a higher standard of the private contractor than they are willing to fund in the TTC itself. Steve: If we ever do privatize any part of the transit system, the city will probably demand a higher standard of the private contractor than … the TTC. In other words, privatizing transit will result in improved service as I have witnessed in many Asian cities including those with some of the best transit systems in the world. Steve: Not necessarily. Private contractors, as we have seen here and elsewhere, exploit shortcomings in contract language and an unwillingness to closely manage their performance to gain extra fees or to shirk their responsibilities. In the worst case, they walk away from contracts as a business decision to cut their losses. Steve: It is also important to review on a city by city basis the degree to which those “private” companies receive government support or otherwise favourable conditions for their operations. Also, those spiffy ultra-modern systems will need a refresh and significant investment by the middle of this century. Will the private companies still be around and willing to spend, or will they walk away just as the Toronto Railway Company did leaving decrepit infrastructure? The question I would have is: does it make sense that the TTC board and the city start by taking a realistic look at how transit should be managed, and creating some incentives for the TTC to actually deliver it. I can understand ragged service in the middle of a line, but where you have vehicles pilling up entering the terminus, and yet still have ragged headways on departure from the same terminus, this is hard to justify. While it might make sense that you might push out a couple of vehicles early to make room, this should not result in a long gap shortly after. If it is supposed to be a 4 minute headway at departure, hold the last vehicle in the terminus at least until that 4 minute mark, ideally work to space the last couple in terminus that way, while tracking arriving vehicles. Given the current travel times on KIng, there is little excuse for ragged headway at terminus other than a lack of care. If required have a gate and a timer, that requires line management to over ride for closer than designated headway, of for another vehicle to trip arrival, prior to allowing the one waiting to leave prior to 4 minutes. Surely departure headway at the least could be regulated, without heroic measures. Good answer Steve. In the real end it doesn’t matter if it is privately, partly private, government or federally run. The bottom line is chasing after good service. Which we don’t have considering a world class city G7 type of place. I am not a fan of the GO Transit private / government service, it seems that the deal is between Bombardier/CNR and Ontario, leaving the passengers out of the deal. I have a really bad taste in my mouth of decades of the TTC one institute service. So privitisation and deregulation ideas should still be on the table in search of better service. While the “actual” improvement in running times might only be a couple of minutes if the variance between cars is reduced then the waiting time for cars will be reduced and this would give a much greater perceived improvement in running times but if your waiting time is reduced by 7 or 8 minutes on average that should be considered too. Interesting Twitter thread [Gil Meslin on the wealth of resources around Restaurant Row on King West]. 24. These are vampires, feeding on manufactured division and outrage to extend their unnaturally long political lives. 25. These same opportunists coined ‘St. Clair Disaster’ in 2011/2012. Ask local businesses there about lasting brand damage. Tell people it’s disaster and it becomes a self-fulfilling prophecy. Of course we have seen manufactured division throughout the Scarborough Subway debate too on a much larger scale. The sad thing is the number of otherwise reasonavle pols who listen to this crap.